David Gordon Green’s film about American political strategists working in a Bolivian presidential election is inspired by the 2005 documentary of the same name and covering the same subject matter. (The “star” of that doc was James Carville.) 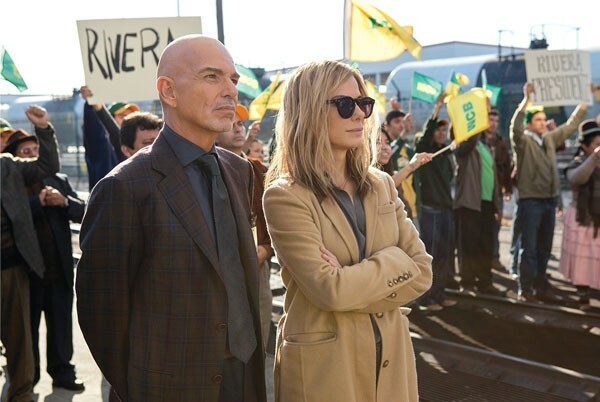 This new fictionalized version aims to be a cynical black comedy, pitting two take-no-prisoners political strategists against each other: the slick Carville analog (Billy Bob Thornton) and “Calamity” Jane (Sandra Bullock), who’s a washed-up mess and thereby also seeking personal redemption. For a while Brand functions as an OK-but-not-great political romp, though its shagginess will have you pining for, say, the 30-minute clarity of Veep. But for a film cynical enough to blithely dip into the forbidden well to make three — three! — jokes about Nazi Germany, it goes right off the rails into a wholly unearned, sentimental, faux-inspirational ending. Bullock’s Jane may be skilled enough to sell the Bolivians on a bum candidate (though the less said about the conceit of Americans jetting in to solve other countries’ problems the better). But this film’s game cast, which also includes Anthony Mackie and Ann Dowd, can’t sell this lame campaign to American viewers.